Finland & Army Norway: In the centre the German divisions reach the main rail line to Murmansk but run out of supplies to attack. 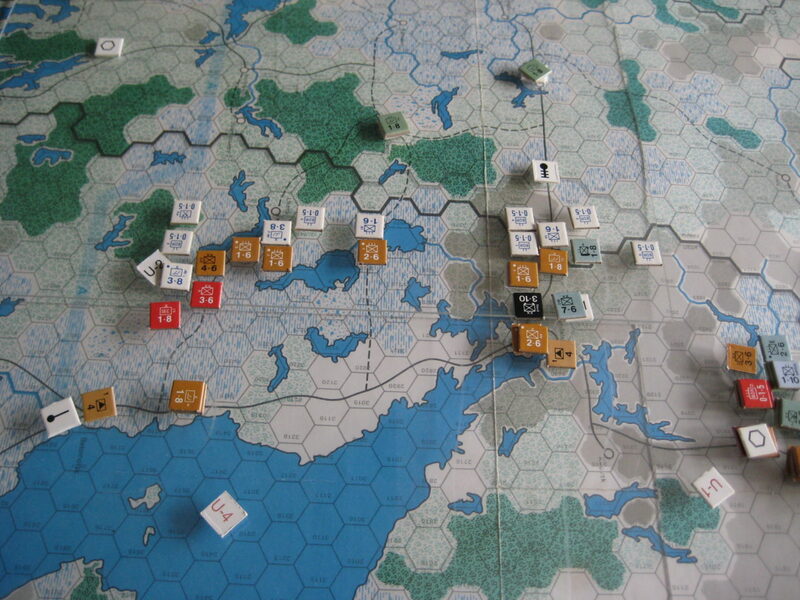 The Finns meanwhile attack the left flank along the lake again eliminating a Soviet stack but do not advance trying to maintain sufficient density against a counter attack. AGN; Gains the forested hex at the eastern terminal of the Dno limited capacity rail line. Trucks move into position to supply the Valdai defenders which maintain DGS support. AGC: The North-western hex of Moscow is becoming a real meat grinder as a HX again eliminates a sizable Soviet stack but fails to gain the hex due to fanatical Guards and NKVD defenders. The Soviet air force however are the heroes loosing 2:1 on machines but keeping sufficient presence over the hex to drop the expected Axis odds one column. 3 German engineers are lost in the exchange. AGS: The German response to the Soviet counter offensive is, of course to counter-counter-attack. 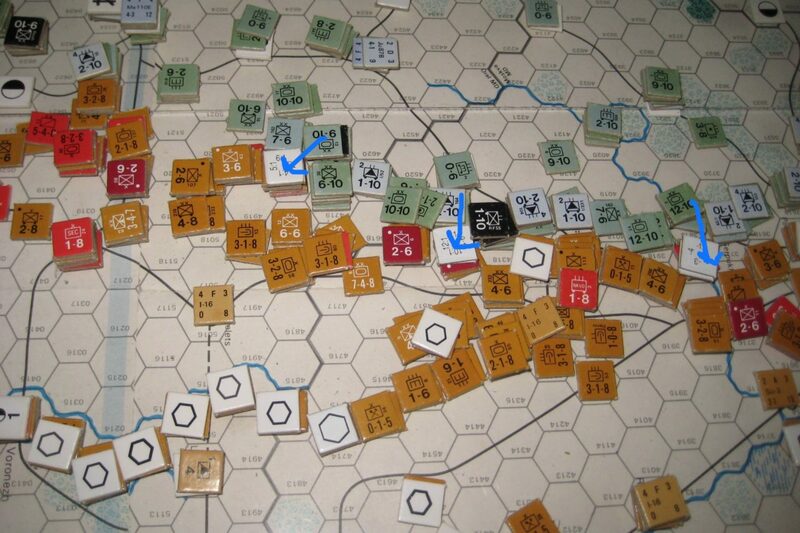 The planned assault on Tula is abandoned and the powerful motorised forces including SS units swing throug h 90O and eliminate two soviet stacks from the assault forces at “the hinge”. In the exploitation phase they move to winterise the defence. Now fully defensive, troops mass to protect Kharkov fearing a Soviet move south. Bemoaning their lack of foresight and overconfidence they re-task engineers from the now postponed assault on Odessa back to the front line to fortify the line. Similarly some artillery assets are re-routed. 11th Army: Troops inch south to invest the outer defensive ring at Sevastopol but are still too weak to attack. Railroad engineers and trucks move to extend supplies for an assault but given the distances involved it will be some months before full supply reaches the citadel. Losses: Soviet Non-Isolated = 62; German Non-isolated = 23.